Almost 5 years ago, I was living in Florence, Italy. For the last month that I lived there, I shared a very small, but adorable, apartment with Danielle, an awesome girl from New York City. We lived near Basilica di San Lorenzo, across from Mercato Centrale, an incredible indoor farmer’s market. It was at this market that I first met fennel. Perhaps we had met before then, but I have no recollection of our introduction. Mercato Centrale was the first place I ever picked up fennel and brought it home with me. I could not get enough of fennel. Almost daily, I brought 1-2 bulbs home. I did not have much money, so I ate pretty cheaply. Occasionally, Danielle and I would share a pizza, or we would eat very lightly from the apertivo offered at a local bar (it’s free if you buy a glass of wine! ), but we mostly ate at home. Our kitchen was extremely tiny and also housed our washer/dryer, so getting too extravagant with cooking was not an option. For most dinners, I would eat an entire raw fennel bulb, accompanied by nothing but some canned white beans cooked with a diced tomato, and possibly some bread. Sometimes I would switch it up by cooking the fennel with the white beans, but I actually preferred it in its raw state. I only vaguely remember some of the nicer meals I ate, when I actually went to a restaurant, but my fennel and white beans I remember vividly as being my favorite. 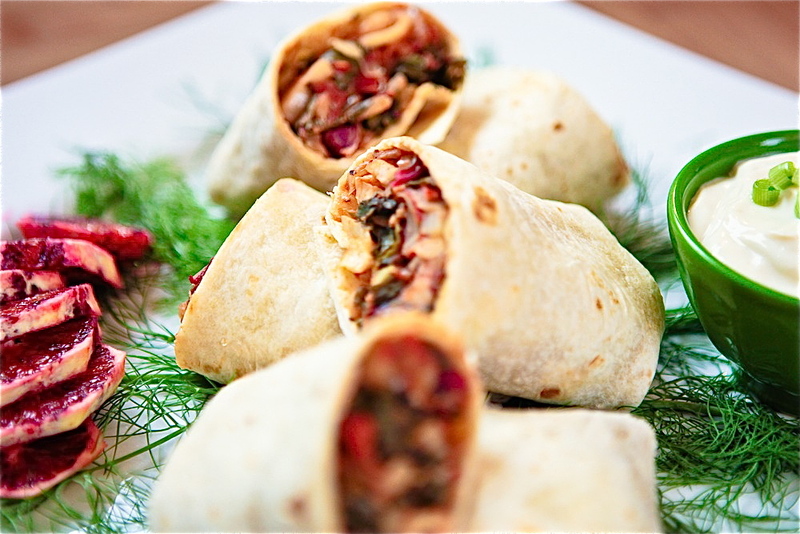 This wrap is the embodiment of my poor girl dinners in Florence, just fancied up a bit. The fennel isn’t raw, there’s some beautiful chard added in (both from our CSA), and there’s a tortilla in place of the freshly baked bread. 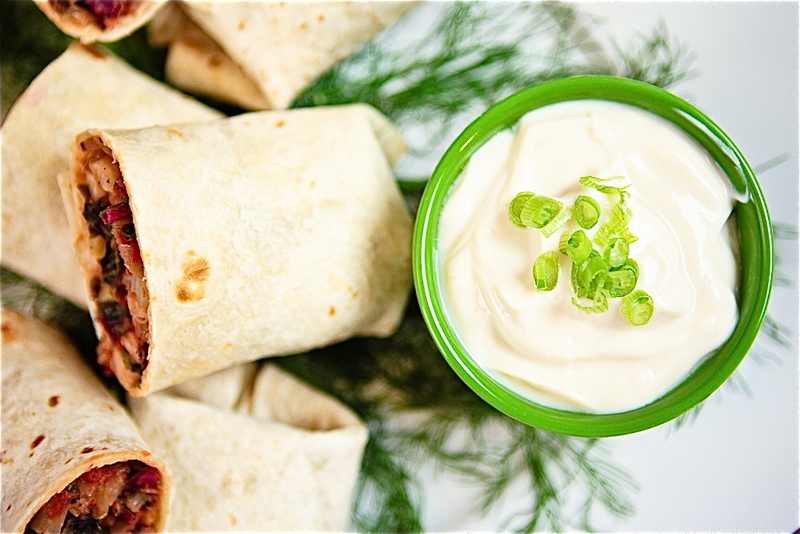 Then I took it up an extra notch and made some tofu sour cream to dollop onto it (you could also put it inside the wrap). It may not transport you to Florence, circa 2007, but it definitely succeeded in making me a little homesick. ½ package of silken tofu (the vacuum packed kind), about 6 oz. In the bowl of a food processor, process all ingredients until smooth. Refrigerate until ready to use. Will keep for about 2 days. In a large shallow, saucepan, heat oil over medium heat for about 30 seconds. Add the onion and garlic and sauté until onion is translucent. Add the fennel and sauté for about 3-5 more minutes, until fennel is slightly translucent as well. Add the white beans, tomatoes, and spices and mix to combine. Cook for about 2-3 more minutes, to let it all heat up, and then mix in the chard. 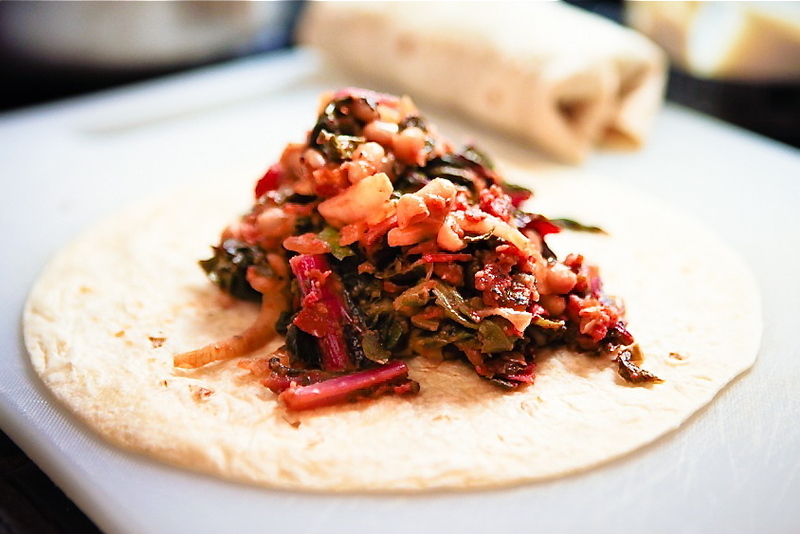 Continue to cook until the chard is just wilted. Remove from heat. Heat your tortillas over a stove burner, or in a pan on the stove, over medium-low heat, just giving each side a minute or two. Scoop about 1 – 1-¼ cup of the bean mixture onto each tortilla. 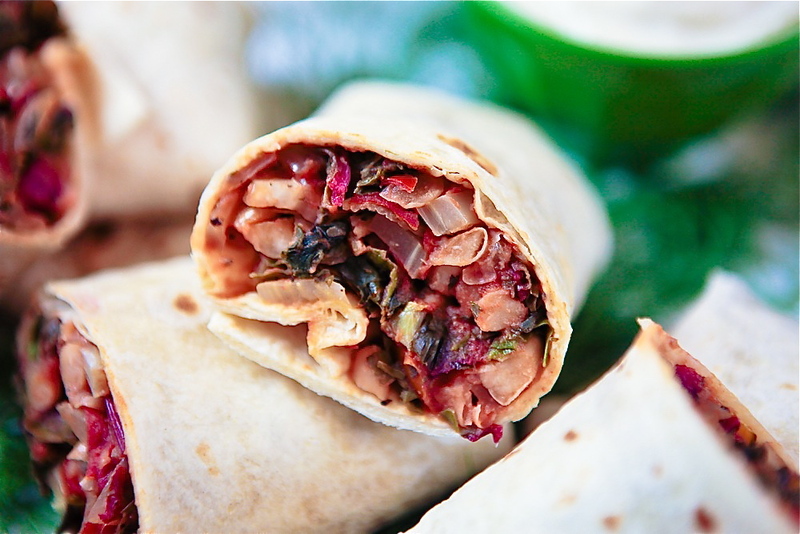 Fold the outer ends of the tortilla over, and using the edge of the tortilla closest to you, roll up, burrito-style. Serve warm with sour cream. It’s pretty amazing to me how are brains associate taste and smell with very specific memories. Are there foods that transport you to another time and place in your life? What are they? 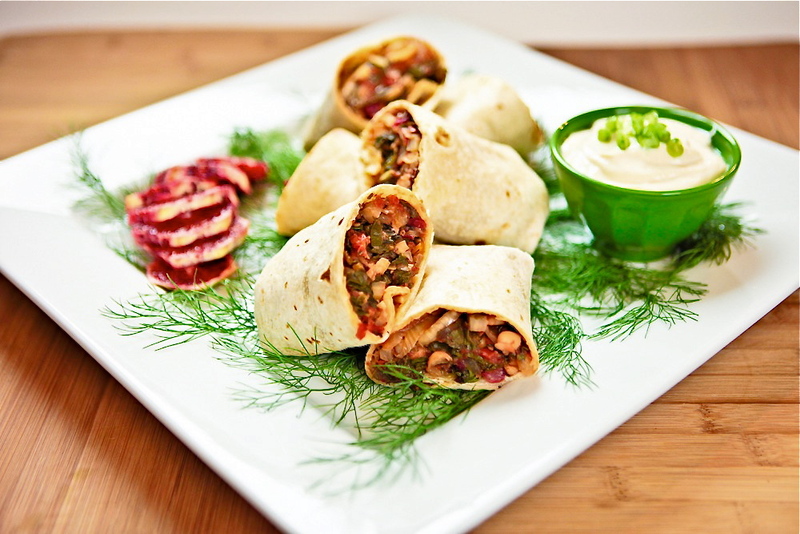 19 Responses to "Fennel, White Bean & Chard Wrap with Sour Cream"
I LOVE raw fennel with vegan olive tapenade – so yum! Thank you, Heather! 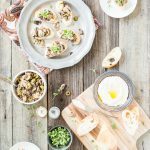 I love the idea of olive tapenade with fennel- I’m going to have to give that a try sometime! The photos are lovely (as usual)! 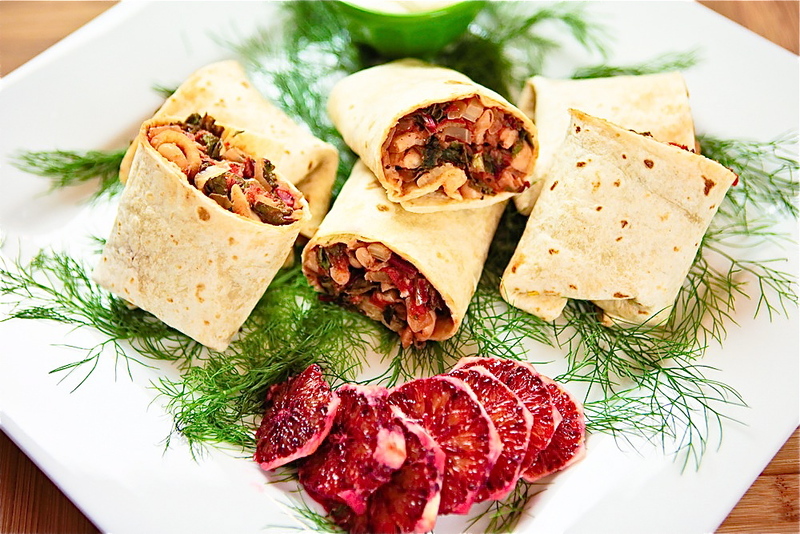 The wraps sound divine. Florence! How lucky! It’s a magical place! Thanks, Annie- I’ll pass the compliment on to Chris! 🙂 And Florence is wonderful- so blessed to have spent some time there. 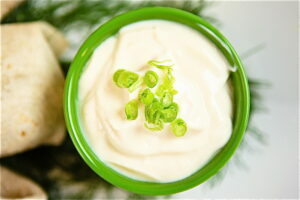 Tofu sour cream?? Awesome! I’m so excited to try this. isn’t funny how the simplest meals are often the ones that stick with us forever? i love this story that you shared. your “cheap” eating sounds so romantic and lovely when imagining it in the backdrop of italy. i imagine you eating your simple but delicious meal of fennel and white beans sitting on top of a checkered sheet-covered hardwood floor in your small italian apartment. 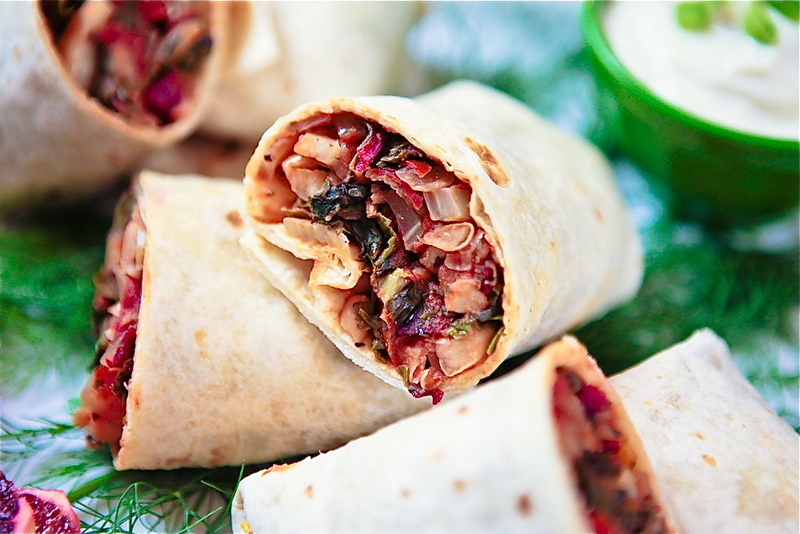 your adaptation of the meal into wrap form looks hearty and delicious. cheers to happy memories abroad! Thank you, Caitlin. That’s so true! The simplest meals are the ones we return to time and time again. It’s funny that you imagined me sitting on the floor, because that’s where I often ate, or I just stood at the kitchen counter. Either way, looking back, it does sound awfully romantic! I never heard of a vegan version of sour cream, but this looks great. Man, my “To-Make” list keeps getting longer and longer, thanks to you 🙂 That sour cream sounds SO MUCH better than the vegan stuff they sell at the stores–excited to try it! Next time we hang out, you are cooking 🙂 ha! Oh my god I loved this. So much. Slight sub: for sour cream, I used tofutti cream cheese, added cider vinegar, lemon, and chopped kalamata olives, no miso. Worked great. 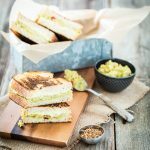 I just became vegan after being a more or less life-long vegetarian, and I have to say, you have a lot of recipes that I’m going to try. Especially now that I know how great this one was. Thank you!